"Loved listening to you guys tonight. Awesome older songs. Need your schedule"
"This band is THE BEST - worth the trip to see them wherever they may be! Go Ben, Go Ben!" Crocodile Smile was the perfect choice for the annual Grove Park Inn Employee Holiday Party. Ben and the guys from the band were reliable, and played great hits that everyone enjoyed! 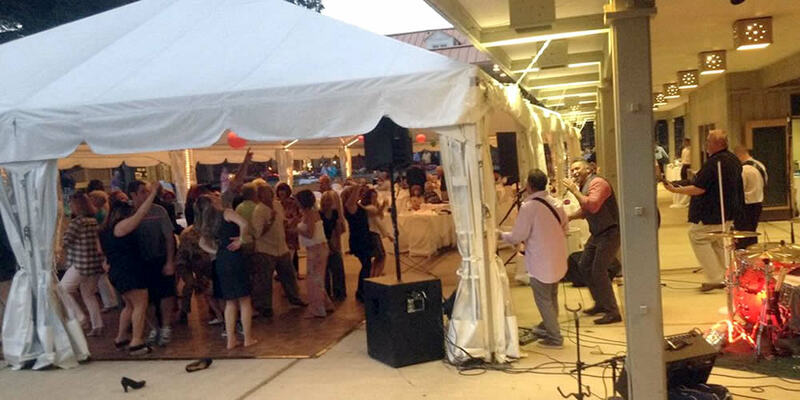 The quality of the band was awesome, we've received rave reviews from employees stating they enjoyed the party and the band helped to make it a real success! You rocked. There's no other way to say it: you rocked. Our wedding was totally magical and FUN thanks to you! During dinner it was like you read my mind and played so many of my favorite songs that I had forgotten to request! And you played a ton of Clint's songs, too. I looked across the table during dinner and Clint's mom was totally swaying and singing in her chair to one of our favorite songs. Such a special memory. Then the dance party. It was PERFECT. Everyone danced: kids, our friends, our families, our family friends; and that was just how we wanted it. One wife even told me this was the first time she had seen her husband dance in their 20 years of marriage. I keep having flashbacks to seeing our friends and sisters cutting a rug with huge smiles on their faces. Thanks also for rolling with all of our weird requests (the lip sync, choreographed dance, guest singer/keyboard player, oldest couple dance, hora... I know it was a lot). We just had to write from our honeymoon to say THANK YOU for everything.